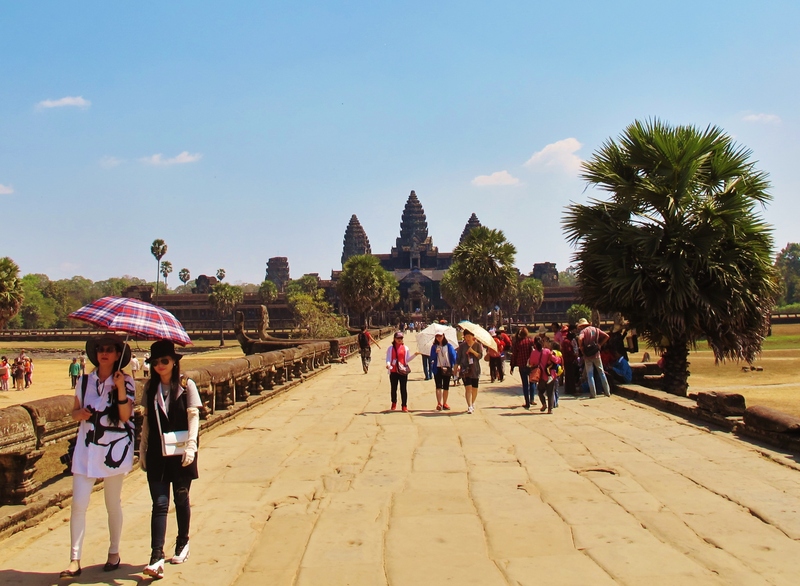 Angkor Wat – a very popular tourist attraction. However, it is possible to find a range of forest birds in the surrounding woodland. No visit to Siem Reap is complete without spending at least one day visiting the famous temples of Angkor. Fortunately for birders, the temples area is heavily wooded and rather rich in bird life – even a short jaunt into the forest is likely to turn up at least a few interesting sightings. The Ta Prohm temple is guaranteed to produce sightings of Red-breasted Parakeet, and I was lucky today with a pair of the much less common Alexandrine Parakeet in a dead tree near the west gate. I also saw a Black Baza here, while at Angkor Wat the pick of the bunch was a small flock of Ashy Minivets. 2015 Year Ticks: Ashy Minivet, Ashy Drongo, Taiga Flycatcher, Asian Brown Flycatcher, Black-naped Oriole, Black-headed Bulbul, Scarlet-backed Flowerpecker, Black Baza, Red-breasted Parakeet, Alexandrine Parakeet (total 247).